When I attempt to select iCloud Photo Library to automatically upload my photos a box pops up telling me that the operation couldn’t be completed. Could you please advise with how to solve this? I hadn’t seen this before, but after some research, it appears that it’s related to the iTunes Store, improbably as that seems. 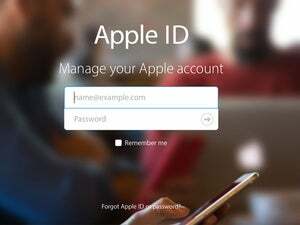 The com.apple.AOSAccounts refers to a preference file, which Apple uses a reverse domain-style notation as a unique bundle identifier. AOS stands for Apple Online Services, an atavistic name that I’ve never seen attached to any modern Apple documentation. 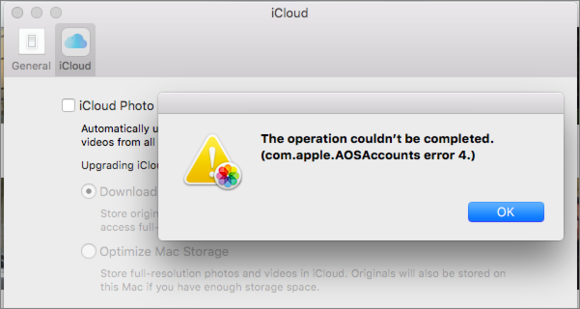 This error seems to be related to iCloud Photo Library, but it’s really an iTunes Store problem. Some folks on the wide Internet have seen this same error 4, and after much troubleshooting, found the way to clear this state is to log into an iTunes Store account in the OS X version of iTunes, check credit-card information, and update it if it threw an error. 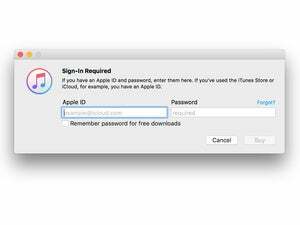 In some cases, people only had to log out of their iTunes Store account in iTunes, and then log back in to clear the condition. Why this is connected to iCloud Photo Library is beyond me. It’s possible that because there’s a free or paid iCloud account associated with one’s Apple ID, that a problem with an iTunes Store account linked to the same Apple ID inaccurately produces this error? Hard to say. Let me know if this afflicted you and how you solved it, too.